Statcounter provides customisable hit counters, visitor tracking, web analytics and website stats for IMCreator. Log into your IMCreator.com account (opens in a new window) with your username and password. A box similar to the one below will pop up on your page. Insert your StatCounter code. Select "OK". Depending on the version of the code you've selected, your counter will show up as indicated below. Note, if you have installed an invisible counter the box will be empty. Drag the HTML box where you'd like to place it on your website. We recommend towards the bottom of the page. Follow this same procedure on each page of your IM Creator site. You may view your other pages by going to "Pages" option. 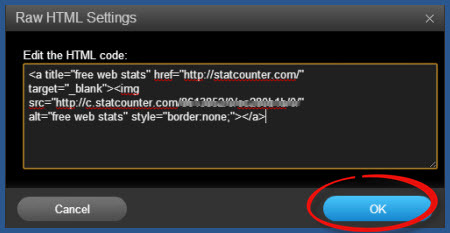 StatCounter is now active on your IM Creator site and will immediately begin recording visitor information. Sign up for a Statcounter account using our IMCreator installation guide. You can reinstall IMCreator on your Statcounter project.